Shelf Inflicted: Did Anyone Get the License On That Car? Did Anyone Get the License On That Car? 4 out 5 stars on top of Christmas trees. As a little girl Victoria McQueen has a magical talent for finding things. While riding her bike and focusing on what she’s looking for, Vic can conjure up an old wooden bridge that she can cross and be at the spot where the lost object is. Vic mainly uses her powers to distract herself from the constant fighting of her parents, and she eventually meets an eccentric librarian named Maggie with her own supernatural power who explains that Vic is tapping into imagination itself and plowing tunnels through it. Vic eventually runs across Charlie during her travels, and the encounter doesn’t go well for either of them. Years later, Vic’s adult life has been a steady descent into what seems like madness, but she’s trying to finally repair her relationship with her son when Charlie returns. 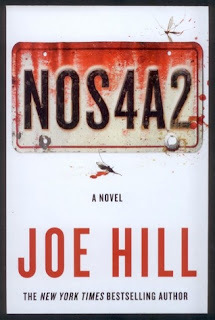 It’s probably inevitable that Joe Hill will be compared to his father Stephen King whether it’s fair or not, but the concept and characters seem very much like old school King to me. However, it’s hard to see how Hill could possibly not be influenced by the old man, and in this case, that makes for a tense and fascinating horror novel. The villains really stood out in this one. Charlie Manx isn’t really a vampire, but he exists in a way by sucking the life out of children. However, since he legitimately sees himself as saving kids from worse fates and providing them with an eternity of fun, it makes him more interesting than just a monster who gets his jollies by murdering kids. Charlie’s sidekick, Bing Partridge, is a simpleton who is terrifying in his role as the Gasmask Man that wants to help Mr. Manx to earn himself a permanent place in Christmasland. But it’s Vic McQueen that really made me love this story. As a bright kid with a knack for art, it’s painful to see how her ability and meeting Charlie Manx seriously screws her up life. Hill has created a believable and damaged woman who writes and illustrates kid’s books, but also has tattoos and a drinking problem. Vic is a graduate of the Lisbeth Salander Charm School, and she’ll hit you in the face with the wrench she’s using to fix a motorcycle if you give her any grief. The book has a couple of problems. At almost 700 pages, Joe Hill apparently inherited King’s penchant for writing big books. While the action does move along at a pretty swift pace it still seems like it could have been tightened up. (In Hill’s defense, his stuff moves much faster than his dad. If King would have done this story, it probably would have been 1200+ pages.) There’s also some plot inconsistencies. However, none of my minor gripes prevented me from thoroughly enjoying this very creepy action horror novel with a memorable main character. One more note, I listened to the audible version of this, and it was narrated by Kate Mulgrew who gave an absolutely incredible reading of it with multiple character voices. It was especially fun because of Vic’s foul mouth which made it sound like Captain Janeway was cursing people like a drunken sailor. Engage, you bastards!